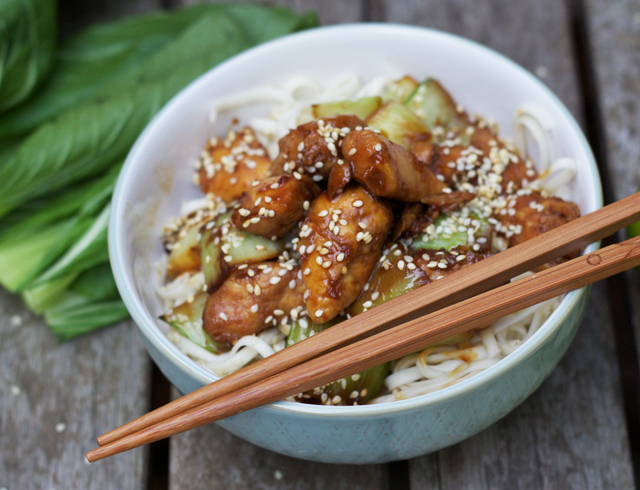 Chicken teriyaki with udon noodles, pak choi, and sesame. About a month or so ago, I went through a phase of being completely and utterly obsessed with Wagamamas Amai Udon noodles. I could quite happily have eaten those noodles three times a day with a little pot of kimchi as a snack in between, seven days a week. But since Wagamamas isn’t the cheapest and I’ve been wanting to learn to cook Asian food for a while now, I decided to have a go at making an udon noodle dish myself. This recipe’s adapted from one of Nigella’s. When I grow up, I’d like to be Nigella Lawson, please. But really though, wouldn’t we all? I love how completely, unashamedly flamboyant she is, and that her recipes are absolutely failsafe. I did tinker with this one though, just a little. I’ve done away with 30ml sake (I’m certain noone but Nigella actually has things like sake in their kitchen anyway) and added in a squeeze of lime and a big bunch of pak choi instead (or is it bok choi?). I think it’s delicious. 1. 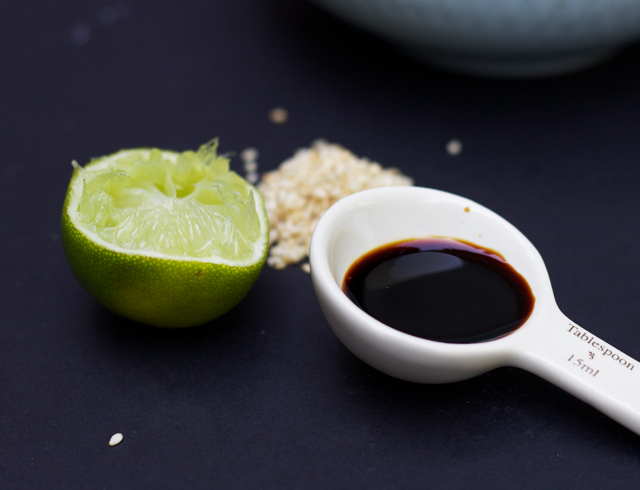 Mix the lime juice, mirin, soy sauce, brown sugar, grated ginger, and sesame oil in a large dish. 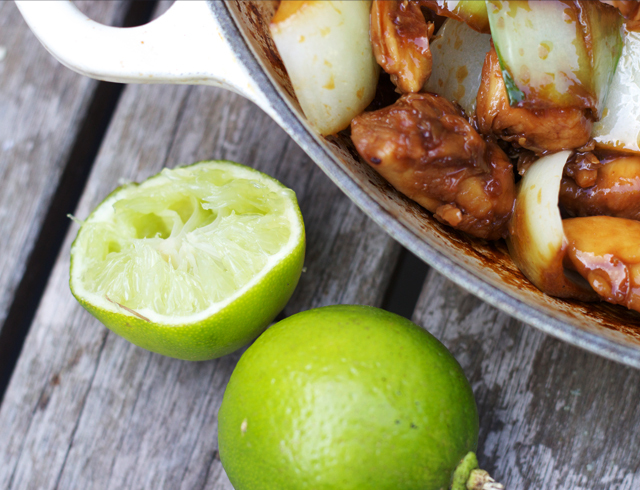 Cut up the chicken into bitesize pieces, and add to the dish to marinate. Leave for at least 15 minutes, but the longer the better. 2. Heat up some more sesame oil in a shallow casserole dish (or any pan with a lid) and, using a slotted spoon, take all the chicken out of its marinade and add it to the casserole dish. Cook the chicken gently until opaque on the outside. 3. Pour the marinade over the chicken, allow to bubble, then reduce the heat so it’s at a gentle simmer and cover with the lid. Allow it to cook, with the lid on, for five minutes, or until the chicken is cooked through. 4. Take out the chicken using a slotted spoon and transfer to a foil covered dish to keep warm. Turn the heat right up in the pan and let the sauce bubble away until it becomes dark and syrupy, then add to the chicken. 5. 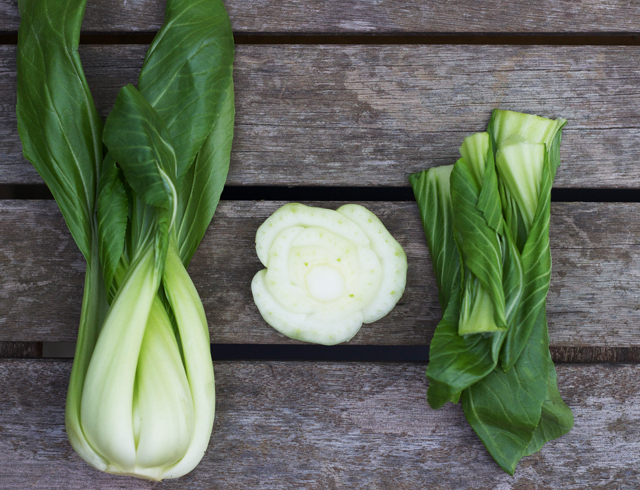 Chop up the pak choi (discarding leaves and root) into roughly one inch chunks. Add to the pan, and cook for a couple of minutes (with a splash of oil, if needed) until tender. 6. Whilst the pak choi is cooking, add the udon noodles to a pan of boiling water. Cook as per packet instructions (usually about 3 minutes or so) and drain. 7. Add the cooked noodles, chicken, and sauce to the pan with the pak choi, and stir until all the noodles are well coated in sauce. 8. 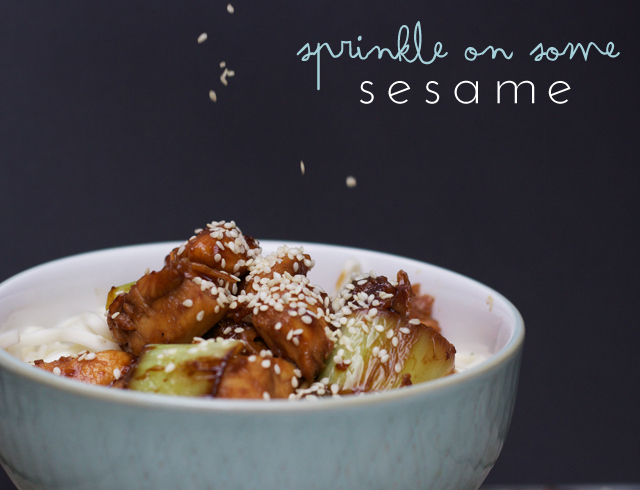 Serve immediately with a sprinkle of toasted sesame seeds on top, or leave in the pan to be reheated later on. P.s. The chicken in this dish could easily (and deliciously!) be replaced with prawns, salmon, or even tofu! Hope you have a lovely rest of your day and I really can’t wait to try this! I can’t wait to try this. Oh nyom, nyom, nyom! It’s looks just as good, if not better, than anything you’d order in Wagamamas! I’m chuckling about how, with the lack of profile images next to comments on my blog, it totally looks like I’ve left this comment myself! ;) I hope you like the recipe when you try it! I’m craving a bowl right now! Looks yummy! Mine would never look that neat and pretty! seriously drooling right now! need to make this!! This sounds amazing, I’ve been obsessed with noodles recently as well, and now I’m desperate to get home and cook that up. Oh man, I just finished my launch and I’m already hungry by looking at your photos. 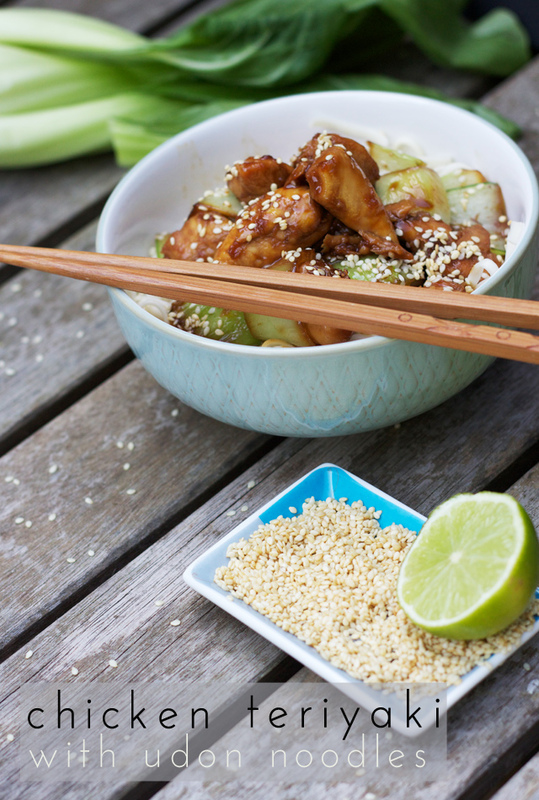 Teriyaki is my absolute favourite thing in the world! It’s amazing with salmon too (although this is one of my only options, being pescetarian! ), but this chicken does look really good! It’s lovely with tofu too, but I think that might be one of my own creations, as I’ve never seen teriyaki tofu in a noodle house! Fantastic points altogether, you just received a new reader. What may you recommend about your submit that you just made a few days ago? Any sure?